Ask most Australian cricketers which Test they would choose if they could play only one in their entire career, and you can guarantee plenty would pick a Boxing Day Ashes Test at the MCG. This was precisely the scenario that fell in Matthew Nicholson's lap in 1998 at the age of 24 - although, of course, he had no idea it would be his only Test. Still, what more could Nicholson have asked for on his Test debut than to walk out with Mark Taylor's men in a golden era of Australian cricket, against the old enemy, the Ashes already secured, at the home of cricket, in front of a packed stadium on the biggest day on the Australian cricket calendar? Well, for one thing, he could have asked for that to actually happen. Because as things turned out, it didn't. "Boxing Day was completely rained out," Nicholson says. "It was disappointing because there were 60,000 in there. We were just about to go out for the anthems, which is a big moment for a young bloke about to go out and play your first game for your country, and it started raining just before we went out. That was quite a draining day, sitting around, nervous, waiting to go out and play, and then we went out the next day and played and it was about 10 degrees." But Nicholson was just thrilled to be there. While waiting in the MCG rooms for Boxing Day play that never eventuated, everywhere he looked was a champion player. Taylor. Steve Waugh. Mark Waugh. 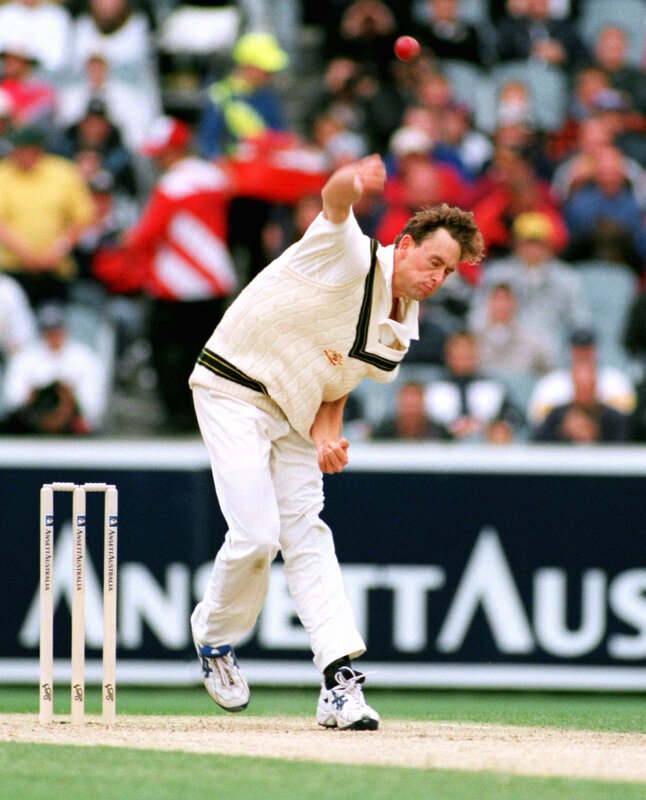 Glenn McGrath. Ian Healy. Justin Langer. Michael Slater. Stuart MacGill. Damien Fleming. Darren Lehmann. And here was Nicholson, with only eight first-class matches to his name, now one of their peers. "Jason Gillespie got injured in the previous Test, did a little hamstring I think it was," Nicholson says. "They played an Australia A game at the same time and Kasprowicz and Bichel both got injured in the Australia A game. Our Shield round was in line with the Australia A game. All of a sudden, three blokes fell over, so they were looking for the fourth bloke in line, which turned out to be me. It was unlikely." It would have seemed even less likely two years earlier, when Nicholson was struck down with chronic fatigue syndrome. The problem originated in India on an Australia Under-19s tour, when he became very sick with salmonella poisoning. After that, he never quite felt 100% right. "It just got to the point where I couldn't play anymore," he says. "I just fell in a big heap. I just thought I was sick - but I never got better. I said, 'I can't play the next game because I'm sick', and then I never got better. It took 18 months to get to the point where I could get back on the field and play to the level that I wanted to play at. "It was a long process of medicos and alternative therapies and all sorts of things. Eventually I worked my way through it. I had a very, very clean diet and no alcohol, no caffeine, none of that. Clean, whole foods - which we should be eating anyway. Most people can eat more freely. Even to this day I need to be a little bit careful." So to be part of Australia's Test team so soon afterwards was a significant achievement for Nicholson. He learnt of his call-up while on board a plane about to fly from Perth to Sydney to see his family for Christmas. A member of the cabin crew told him the WACA had been trying to contact him; he borrowed the mobile phone of another passenger - a huge brick of a thing in those days - and was shocked to be told to disembark and board another plane for Melbourne. He remembers how daunting it felt to join a team full of legendary players, but recalls that Healy and Lehmann in particular welcomed him into the group. He did not know until the morning of the match that he would be part of the XI - Colin Miller was also in the squad, vying for the last place in the attack - and he thinks Taylor presented him with his baggy green on the field before play, though the memory is hazy. When play finally began on the second day, Nicholson snared Nasser Hussain as his first Test wicket, caught behind by Healy. In the next innings, he picked up 3 for 56 - Hussain once again, as well as Mark Ramprakash and Warren Hegg, the England wicketkeeper, who was also on debut. Nicholson's main disappointment was, as a handy lower-order striker, not contributing more with the bat. Australia found themselves chasing 175 for victory; he walked out at 7 for 140 to join Steve Waugh, and put on 21 to bring the target within touching distance. But Nicholson edged behind off Dean Headley, playing an unusually tentative shot. The final two wickets tumbled, and Australia lost by 12 runs. "In hindsight, I wish I'd played my natural game, which was to play some shots, and it might have taken a bit of pressure off," he says. "But I was 24 years old and playing my first game, and Tugga said, 'Just don't get out, I'll do the rest.' That's what I tried to do. I didn't score much, but I hung around while he was making some runs. "It was a dramatic sort of game. It was in that period when Australia were struggling with a few small totals. There was a bit of tension around. We got asked if we wanted to come back the next day, because they wanted to extend it half an hour. Tugga said, 'We're finishing tonight, one way or the other.'" As it turned out, the match did not finish in the way Australia had hoped. But they had already retained the Ashes, so the loss didn't hurt as much as it might have. The teams then moved on to Sydney for the final Test, where Shane Warne was included for his first Test since having a shoulder operation, and Miller was brought in as another spin option. Nicholson was left out. "It was a tough team to crack," Nicholson says. "I'm very proud that I played one Test. But on reflection, I probably played when I wasn't quite ready, got picked a little bit on potential. I hadn't been around for very long. I was bowling fast and getting some wickets at the time. "So they picked a person who was in form and had the right attributes. Given we'd already retained the Ashes, it was probably a good selection. But I probably wasn't quite ready. Maybe three or four years down the track I was really ready to go, but I didn't get a crack because it was such a hard team to get into. "In my era, blokes like Paul Reiffel, Andy Bichel, Michael Kasprowicz played 15 or 20 Tests [Reiffel played 35, Bichel 19 and Kasprowicz 38]. These days those blokes would be the leaders of your attack. 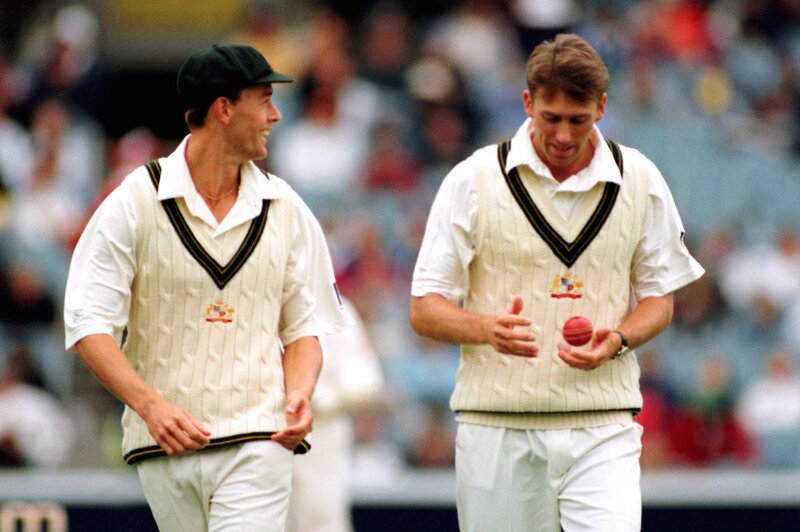 Above them you had McGrath, Gillespie and Lee, who all took 700, 200 and 300 Test wickets. It's just astounding how much depth we used to have." It goes without saying that in the past decade Australia would have given anything to have such depth again. Nicholson was cap No. 380; it took Australia almost another ten years to reach cap No. 400 (Brad Haddin). In less than a decade since Haddin's debut, they have now rocketed along to cap No. 450. "People can be almost apologetic that you've only played the one Test and feel a bit sorry for you. But I'm really proud that I was able to play one, and in a really tough era"
"I think we went through a little bit of a period where guys weren't having to earn the next step - whatever that next step was," Nicholson says. "It even filtered down into grade cricket, where people were picked on potential rather than actually earning it in second grade to get to first grade. "I understand the whole pathway process. I'm sure it's got benefits. But there's got to be a balance between that and making blokes earn it as well, because the mental side of the game at this level is just as important. If someone is coming into Test cricket knowing he's really earned it, like Mike Hussey - and he really earned it - he knows when he plays Test cricket that he's going to do well." Of course, Nicholson is well aware that he too was picked early. And after he retired from first-class cricket in 2008 with 406 wickets to his name, he spent a year on the New South Wales selection panel while still playing grade cricket. It gave him a unique insight into the merits of young up-and-comers like Moises Henriques and Usman Khawaja. "I was on the panel when Dave Warner made his debut and batted at six in a first-class game," he says. "He really hadn't played much four-day cricket. He hadn't set the world on fire in grade cricket, or in any of the 2nd XI games he'd played. But he'd played a bit of one-day cricket for the state and did pretty well, then got picked for Australia and exploded at the MCG. "We took a bit of a punt - and there was a lot of debate about whether we thought he'd done enough to get in the side. I think he got 40, played the way he plays, looked good, and the rest is history. I have to admit I wasn't 100% convinced that he could do it - purely because he hadn't done it at the level below, in the longer form. But he's found a way and in the last couple of years his batting is so much more selective." 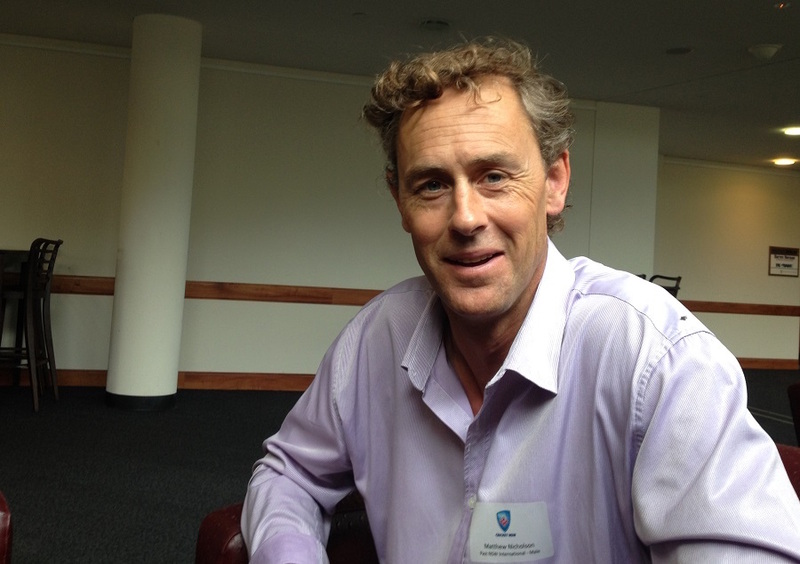 Since then, Nicholson has spent time coaching New South Wales fast bowlers, mentoring, running the cricket programme at Newington College in Sydney, and then he moved into sales with a medical company. But the love of cricket remains. The baggy green cap is at home in a cupboard, and Nicholson's kids get a thrill out of wearing it. Just as their dad got a similar thrill nearly 20 years ago. "I got close [to a recall] a couple of times, on standby and that sort of stuff," Nicholson says. "I dunno, you might be better off to be a one-Test trivia question than someone who's played three or four. "For me it's all about getting the most out of yourself and I can honestly say that I did. In Australia, it can be a funny attitude sometimes - people can be almost apologetic that you've only played the one Test and feel a bit sorry for you. But I'm really proud that I was able to play one, and in a really tough era." And what a one to play: a Boxing Day Ashes Test at the MCG. The Cricket Monthly is changing. After 35 issues, beginning August 2014, it is going to become a more regular part of your life. Instead of a fully formed issue appearing at the start of every month, one feature will be published every day or so. In its more dynamic form, TCM will be more topical and urgent, while staying true to its founding ambition of scale and depth, and combining quality of writing with rigour of reportage and the spirit of narrative storytelling. It's going from monthly to month-long.